Kargoth and Cuthbert are rumored to have been brothers. At some point, no one knows how, they grew apart. Where Cuthbert grew to believe Tehra stained by influence of Chaos and Warp, Kargoth grew to believe that every god's purpose could be satisfied in Tehra... that Tehra would be a battle ground of divine wills. Kargoth recruits a quorum of paladins from all gods and they follow him for a time after their deaths. Also named the Paladin God of Wrath, Kargoth shuns the use of avatars and intervenes himself when the stakes are high. Kargoth and those who serve him are not evil... though they may serve evil gods. Kargoth's philosophy is "only in death will your god see your true worship." Paladins serving outside Heaven, like Malcor for example, cross Kargoth's dominion and derive their unique powers from Kargoth. The firesword, a divine steed, resistance to magic and poison, and the continuation of their powers in other realms... these come from Kargoth. 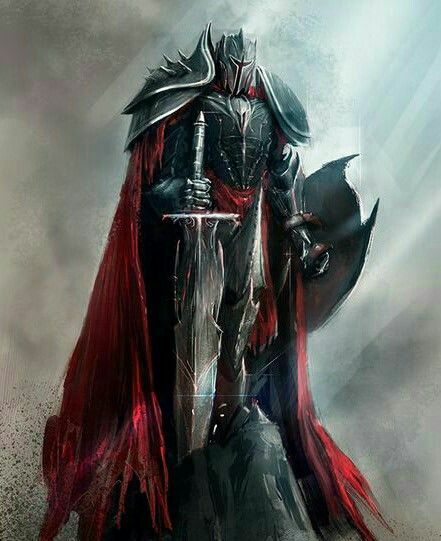 Kargoth is also named the God of Swords, as he never appears with the same sword twice and often will gift his sword to a paladin that impresses him. Kargoth has a tendency to go berserk in battle and fight until is dead, or is rescued by his entourage.